The advent of the NEM has been delayed beyond our expectations this year. Vagaries had predicted its advance by the 16th. on 1st October, taking into considerations the withdrawal of the SWM by the 12th etc. The SWM lingered on, and even today, on the 22nd, is still prevailing over Karnataka and T.N. 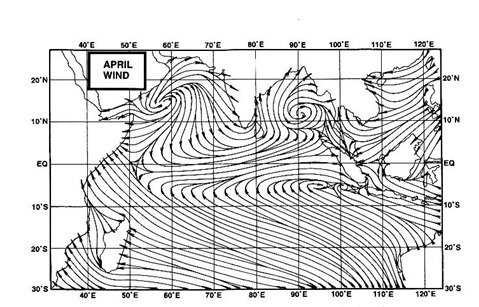 The Upper winds during the NEM across the Bay are in a clockwise direction.That is an anti-cyclone is formed. At a level of 500 mb, the centre of the anticyclone shifts to central Burma region.Another factor are the jet streams. In the SWM, the Tropical Easterly Jet stream dominates the Peninsula, while the Sub-tropical Westerly Jet Stream is the feature of the NEM. The normal Sea Level Pressure during the NEM is a large system of low pressure over the Central Bay. It can extend into the Indian Peninsula as a trough.Towards the end of November,there is a shift southwards of this extended low. -The general variations and fluctuations in intensity of this low pressure, governs the rainfall. When the trough is well defined, and the low is well marked, rainfall over the southern peninsula is good. -During the NEM, an occasional burst of cold air from the Siberian High develops a low pressure sysytems over the Equatorial regions of the South China Seas. These systems move slowly westwards thru Sarawak/Eastern Malaysia coast, and remnants of these cross over into the Bay and form depressions. Most of the NEM rains depend on depressions and cyclones from the Bay towards the East Coast of India. The overall delayed actions, beyond forecast estimates, is mainly attributed to the stubborn SWM, and to some extent the weak MJO not "supporting" the fast formation of NEM currents in the Bay. Cooler SSTs are prevailing west of Java and Sumatra. But, the upper winds are showing signs of "resigning" and changing. The Mascrene highs have lost their grip, and are weaker, and the Tibetan/Siberian High is taking shape ,though late . In my last report on the La-Nina, we have discussed that La-Nina is "on the threshhold" of forming..not yet established.There has been little change from then, as atmospheric indicators continue to hover around La Niña thresholds. The Southern Oscillation Index (SOI) strengthened over the past seven days, with a 30-day SOI value of +10.0 as on 16th October. Sustained SOI values above +8.0 can indicate La Niña events. Factors favour the formation of a La-Nina event within the next 30 days. Anyway, the latest models show the MJO getting a bit stronger from next week (24th), and moving eastwards in the seas South of Sri Lanka, along the 8N line. Its only after 2nd November that the MJO is shown getting stronger (and more effective) in the entire Bay region. A UAC today lies over South T.N. and adjoining Sri Lanka. This holds out hope of creating an Easterly wave, which can push a current, a NEM current, onto the T.N. coast initially, and then into the interiors and forcing the SWM "out". Another system lies over the Lakshadweep Islands and the Kerala coast. IMD indicates this as a UAC. While the Thai Met Dept indicates it as a low at 1006 mb. the relative humidity becomes very low at panvel between 12- 5pm ,,,,even dropping to 14%,,,,thats too low,@rajesh ,,,,what is the reason for this?? ?,,,also nowadays the sea breeeze also doesnt sets ,,,its very hot and dry with absolutely clear sky.....am still waiting for that depression!!!!! !